Boarding the plane to Milwaukee International Airport for an Evinrude press event and dealer meeting, I had no idea what was about to be introduced to me. Sitting in the seat getting ready to take off, I was eager to see what Evinrude had in store for their new two-stroke line up, but at the same time, I was thinking ‘what could they possibly show me that I haven’t already seen?’ Having tested boats and engines for more than 20 years, I’ve seen a lot of new product launches and new technology advancements, but what was left for me to see? What was left for me to get excited about? After landing, I grabbed a quick bite at a local restaurant that specializes in Bratwurst, cheese, spices, and mustards, which are common and a specialty of Milwaukee before I headed over to the auditorium for the afternoon’s press event. As the presentation started, I could tell this was not going to be your ordinary product review. 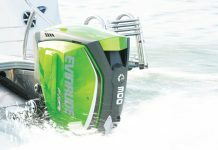 There was something different about the presentations and then there it was – the Evinrude E-Tec G2 series. I had officially been ‘wowed’. Before me stood a two-stroke engine that really didn’t look like an outboard and had been built and designed from the bottom up by BRP. This was going to be an exciting. 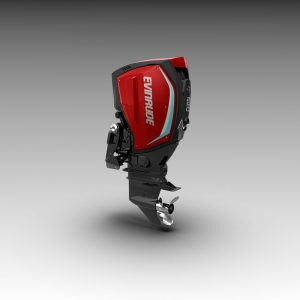 When Evinrude started on its quest more than five years ago to build something that no one had seen before they set one bold guideline: “Develop something that can stand out from 200 yards away at dusk”. If you think about it, this is not an easy task. However, they not only met that goal, but exceeded it. This engine is built with a super hero in mind. The G2 has traditional values in terms of two-stroke engines and the rich heritage behind both the BRP and Evinrude brands. The designers listened to customers and came up with optional color schemes to match any boat. It has an exterior armor that can easily be changed. There are 14 different swoosh colors available for the accent that goes with the two standard colors (black or white) and the three optional colors (red, silver or blue) – more than 400 color combinations in all. BRP claims that the G2 outboard delivers a 15 percent fuel economy improvement by being more efficient in changing fuel into energy. At W.O.T., the 300 hp V6 74-degree E-TEC D.I. G2 outboard will burn 21 gallons per hour and burn two to three times less emissions than their competitors. It also produces the lowest levels of carbon monoxide of any outboard currently on the market. This engine is 100 percent global emission complaint and can be run on lakes that only allow Evinrude motors. Their R.A.V.E technology provides horsepower on the top without losing it on the bottom. The gear case is both robust and fast. It has been designed to reduce steering effort, as well as friction with the water, and to have less drag that increases speed and acceleration. The unique shape not only looks cool, but is designed with durability and handling in mind. It has a high capacity water pump and lower water intakes to allow the engine to cool itself faster and is designed with a weed-shedding leading edge to keep the intakes from getting clogged. The gear case sports a larger diameter prop shaft and holds a VVP (Variable Vent Port) prop specifically designed for the G2. The Raker HO is for high speeds, while the RX4 is for everyday use. There are also larger anodes on the lower unit to help fight corrosion. To say that the G2 has it all and that BRP thought of everything, after seeing the visual gear oil inspection container (two gallons) leads me to believe that they have. With this container you no longer have to get messy checking your lower unit oil levels and clarity. You can do it with a simple glance when the cover is off. Additionally, since BRP designed the G2 from scratch for drive-by-wire controls and eliminated cable controls, BRP was able to move the shift actuator into the gear case as there is no longer a need for shift linkages and all the problems that they are accustomed to having. 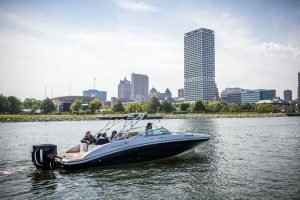 The I-Trim system provides automatic trimming, so the driver no longer has to raise and lower the engine to find the boat’s sweet spot. The engine does it for you. The G2 has the hydraulic steering built into the motor’s midsection. With fewer parts exposed and no additional rigging needed, the hydraulic system is dynamic and beyond easy to use when you are behind the wheel – no matter what speeds you are traveling. One unique feature is that the hydraulic helix (it looks like a cork screw and used on bull dozers) steering system is sitting in a bath of oil to help prevent corrosion and mechanical failures. The electric boost motor is away, behind the motor bracket. The ECU and controls provide you with three modes (built into the ECU) that you can set the amount of feedback that you want when captaining your vessel. The new dual axis rigging system provides a clean look, fewer obstructions and the design eliminates the need for an aftermarket system, thus providing more room on the transom and will allow boat builders to utilize and reclaim the space once needed for the motor. Additionally, the rigging tube stops at the top of the transom bracket and does not move with the motor, thus allowing OEMs to add more space on the transom. The 210 cu. in. G2 block was designed from the inside-out. With Computational Fluid Dynamics (CFD), BRP studied the flow of gas in the cylinders and how both exhaust and gas traveled in and out of the heads. This lead to the distinctive piston thrust away from the hot exhaust port, which leads to increased durability. It also helped improve the air and fuel mixture in the cylinders, which achieved a more-efficient burn and allowed less fuel to escape through the exhaust ports. 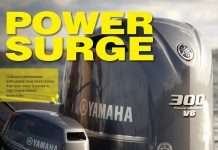 BRP states this design produces 20 percent more torque (over 600-foot pounds at 5,000-6,000 rpms), 15 percent better fuel economy and 75 percent lower emission compared to other outboards in this horsepower range. Completing the redesign is the titanium oxide coating on all aluminum parts and lightning fast microprocessor, which has a failsafe protection mode, an auto break-in period and auto storage function. As I left the dock for the sea trial, I overcompensated for the power steering. Talk about easy to drive. I quickly got the hang of it, and cruised effortlessly out in through the no wake zone. As soon I as had the chance, I pushed down the throttle and discovered first hand that indeed the BRP designers had certainly improved the torque on these new engines. 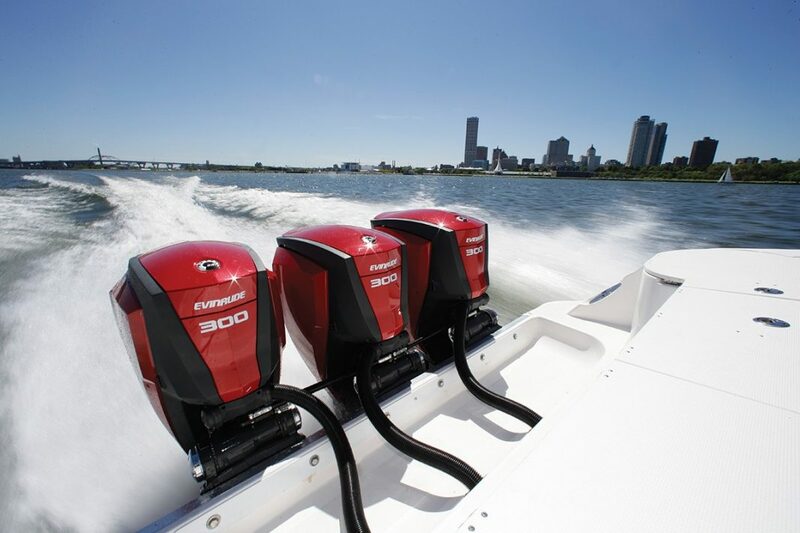 The 210 cubic inch, 74-degree V6 E-TEC direct injection outboard jumped the 2,718-pound Hurricane 2690 deckboat that my test engine was mounted to out of the water and onto plane in under six seconds. We quickly reached the top end speed of 41.2 mph at 5,900 rpm, cutting through choppy water. The auto trim feature on the new 558-pound G2 is sleek and spot on. The auto trim raised the motor to the exact position where the boat would reach optimal performance. For first-time boat owners, this is a great feature to have, as you will never have to play with the trim button. Carving through the chop with frosted white tips, the 26-foot Hurricane performed better than expected (cornering sharply like a smaller runabout), and my expectations were pretty high knowing that the SunDeck was the largest boat Hurricane has produced with an outboard engine. The G2’s power steering performed flawlessly, even in the heaviest winds and water. And this new engine runs on standard 87 octane gasoline. 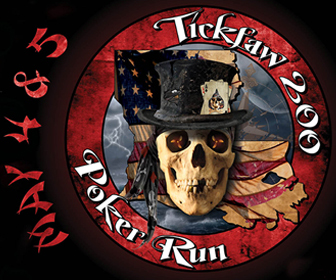 BRP is also putting their money where their mouth is. They are including one of the industry’s best warranties that entails a five-year (North America three-year of BRP limited warranty, plus 2 year of BRP extended service terms B.E.S.T), five-year non-declining corrosion coverage and no dealer-scheduled maintenance is required for five years or 500 hours of operation. 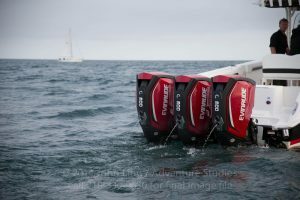 To me, they are showing that they have tested the G2 and are confident that this outboard will do what it’s designed to do and what they say it is going to do.